The third largest whale species after blue whales and fin whales, sei whales are one of the most poorly understood of all baleen whales. Although they were heavily hunted in the modern whaling era, their current distribution, migration patterns and behaviour are not well studied. 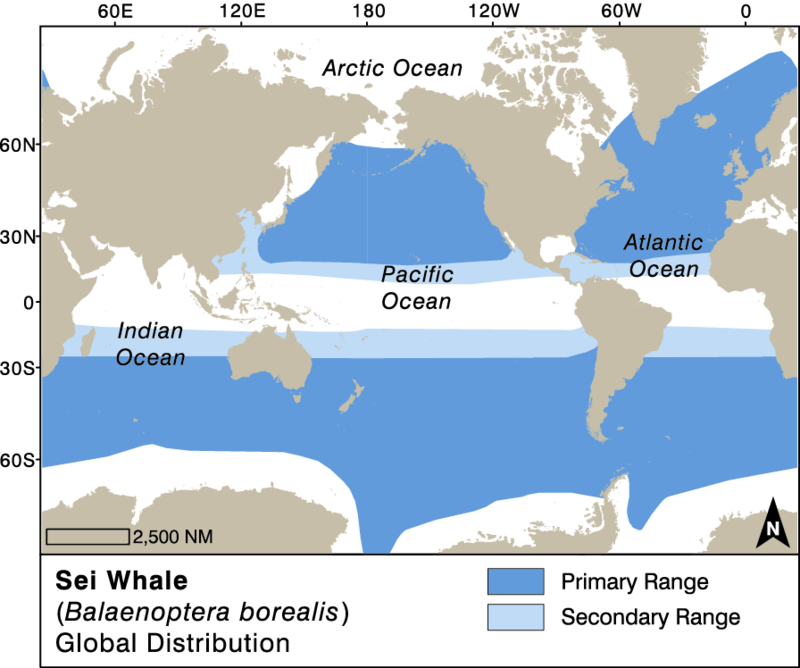 Two sub-species are recognized: B. b. schlegelii in the Southern Hemisphere and B. b. borealis the Northern Hemisphere1. Due to their primarily offshore distribution and their unpredictable seasonal movements, sei whales are not often the main target of whale watching activities. However, they can be observed during whale watching tours where their seasonal habitat overlaps with that of more predictable species like humpback whales, gray whales or minke whales. Sei whale viewed through the water from the deck of a ship. Image: IWC-POWER. 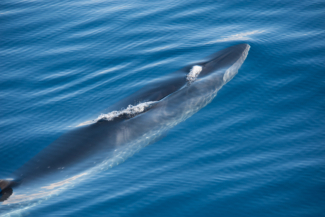 From a distance sei whales could be confused with other rorqual whales like blue, fin or Bryde’s whales. They should be easy to distinguish from fin whales due to the latter species’ unique colouring. 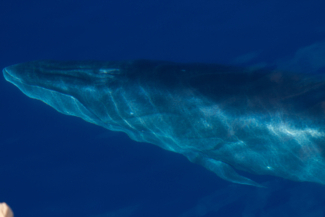 However, differentiation from Bryde’s whales and Omura’s whales is extremely challenging and it is likely that even the scientific literature contains a number of misidentifications. The sei whale head is slightly turned down at the tip of the rostrum, and the Bryde’s whale has three parallel ridges running from the blowhole to the tip of the rostrum, where the sei whale only has one. Sei whales are native to the following countries and territories: Angola; Argentina; Australia; Bahamas; Bermuda; Brazil; Canada; Cape Verde; Chile; Congo; Congo, The Democratic Republic of the; Cuba; Dominican Republic; Falkland Islands (Malvinas); Faroe Islands; French Southern Territories; Gibraltar; Greenland; Haiti; Iceland; Ireland; Japan; Kenya; Korea, Democratic People's Republic of; Korea, Republic of; Madagascar; Mauritania; Mexico; Morocco; Namibia; New Zealand; Northern Mariana Islands; Norway; Peru; Portugal; Réunion; Russian Federation; Saint Helena, Ascension and Tristan da Cunha (Tristan da Cunha); Saint Pierre and Miquelon; South Africa; South Georgia and the South Sandwich Islands; Spain; Turks and Caicos Islands; United Kingdom; United States; Uruguay; Western Sahara. Sei whale seasonal movements are less preditable and less well defined than many other species. Much of what is known about sei whales has been learned from whaling data, as scientists on board whaling vessels kept careful records of catch locations, the size of whales that were caught, and their reproductive status (e.g. were females that were caught pregnant, and if so, at what stage of development was the fetus?). From this data we know that, as with other baleen whales, sei whales usually give birth in mid winter in the lower latitude or warmer areas of the species’ range. Gestation is thought to be 10-12 months, and calves are thought to wean at 6-9 months after they have migrated to colder waters with their mothers. There is no reliable information on natural predators of sei whales, although it is presumed that, as for other baleen whales, only killer whales would be large enough and strong enough to hunt and prey on sei whale calves, if not adults. Since the cessation of commercial whaling, there is very little information on current threats to sei whales. Although ship strikes and entanglement in fishing gear may affect this species to some degree, these threats are likely to be less prevalent in their open ocean habitat than they are in the coastal areas where other whales and dolphins are at greater risk. Once blue whale and fin whale populations began to decline in response to modern whaling in the first half of the 20th century, whaling fleets set their sights on sei whales. They were one of the last whales to still be hunted, with an IWC agreement to cease catches in 1975 in the North Pacific and 1979 in the Antarctic3. 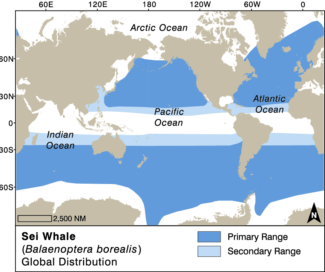 Commercial hunting of Sei Whales ceased in the late 20th century, but catches under Special Permit resumed in the North Pacific in 2004 at the level of 100 per year, and increased to 134 per year in 2017. Global populations were thought to have been reduced by as much as 80% in the 1900’s, creating the rationale for the IUCN to designate the species as Endangered on the Red List of Threatened species. The species is listed under Appendix I of the Convention on Migratory Species (CMS). Sei whales are not often the primary target of whale watching tours, but , they can be observed during whale watching tours in many prime whale watching areas where they occur, such as the Northeast coast of the United States, South Africa5 and British Columbia, Canada6. Sei whale in the Gulf of Maine. Photo courtesy of Whale and Dolphin Conservation USA. 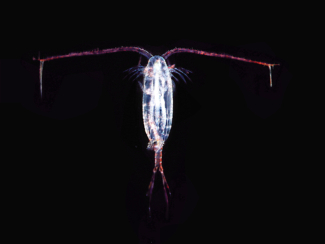 Reilly, S.B., et al., Balaenoptera borealis, in IUCN Red List of Threatened Species. 2008, http://www.iucnredlist.org/det... Downloaded on 9 October 2017. 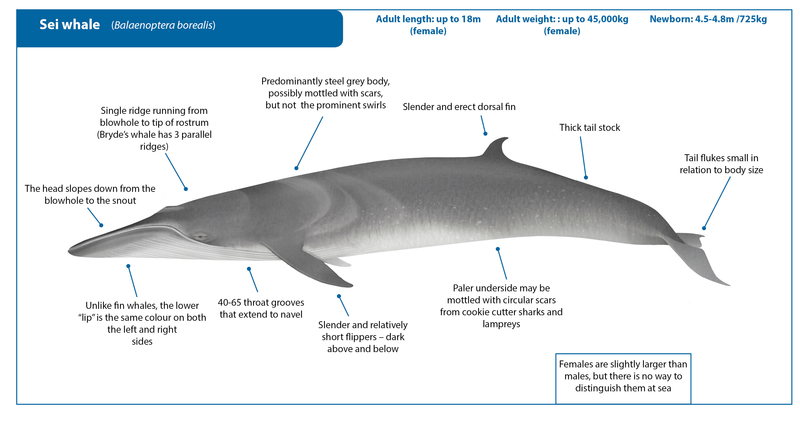 Horwood, J., Sei whale, Balaenoptera borealis, in Encyclopedia of Marine Mammals, W. Perrin, B. Wursig, and J.G.M. Thewissen, Editors. 2009, Elsevier: San Francisco. p. 1001-1003. Best, P.B. and C.H. Lockyer, Reproduction, growth and migrations of sei whales Balaenoptera borealis off the west coast of South Africa in the 1960's South African Journal of Marine Science, 2002. 24 p. 111-133. Gregr, E.J. and A.W. Trites, Predictions of critical habitat for five whale species in the waters of coastal British Columbia. Canadian Journal of Fisheries and Aquatic Science, 2001. 58: p. 1265-1285.